Online payments platform PayPal is launching its first Slack bot, allowing users to send money between PayPal accounts without leaving a Slack conversation, the firm announced on Tuesday morning. The new bot is available to install from the Slack App Directory. 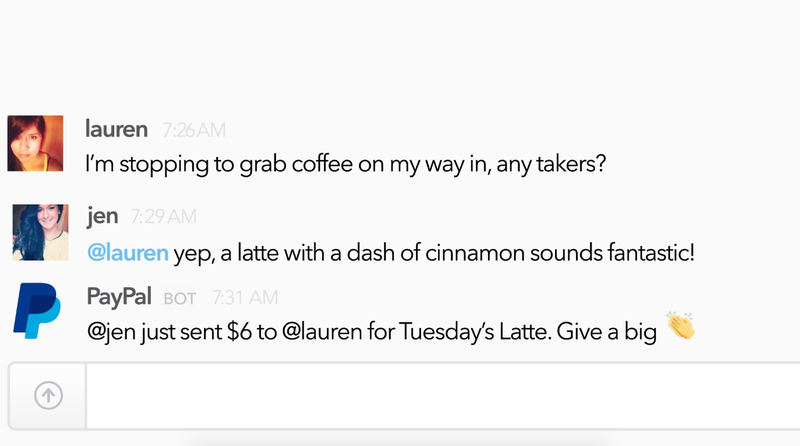 The chat bot will allow Slack users to send money to colleagues by typing commands similar to “/PayPal send $5 to @Dave.” It’s available to Slack users in Canada, the U.S., Australia, and the U.K.
PayPal says that person-to-person payments is one of its most used features, processing $41 billion in volume during 2014 across PayPal Holdings businesses PayPal, Venmo, and Xoom. PayPal has been making efforts to integrate its service into numerous web platforms including voice-activated payments with Apple’s Siri, a tie-in with Microsoft Outlook, and a bot on Facebook Messenger launched last October. PayPal’s Messenger bot enables capabilities to track receipts and access transactions in addition to payments. Though the Messenger integration is limited to the U.S. region for now. The peer-to-peer payments space has been heating up over the past year. PayPal’s own Venmo app exists for that purpose, and other similar service launches include Snapchat’s payments, Square Cash, and Google Wallet. The trend is more advanced in Asia, where WeChat integrated services including mobile and in-store payments. Slack currently has an estimated 5 million users and just launched its Enterprise Grid edition to appeal to larger companies. PayPal says it has about 192 million users worldwide. PayPal declined to do an interview about the service with IT World Canada.